Hi I'm Emily from Looks by Lovelies and we are continuing our collaboration with Delicious Reads on a monthly basis to bring you Looks from Books - a series of inspired looks from the books we are reading on Delicious Reads. This month we had the privilege of reading Walt Disney: An American Original; this read was especially perfect for me because I am a dedicated, serious Disney fan. My husband and I live in Southern California and have Disneyland annual passes, we generally go Disneyland about three times a month. We also chose to honeymoon at Walt Disney World in Florida. 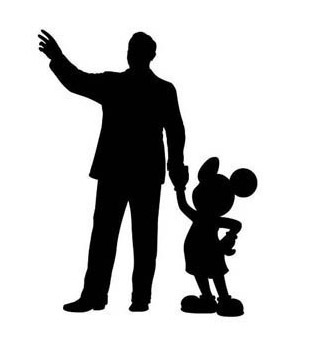 I consider Walt Disney to be a personal hero as well as an American innovator and visionary. We took the following fashion images at Disneyland and California Adventure. The first set of images are inspired by the era when Walt first arrived in California, in 1923. Walt came to Los Angeles with a "frayed cardboard suitcase" and just "40 dollars in his pocket". The main street leading into California adventure is named Buena Vista Street. It recalls the Los Angeles that he might have experienced in the 1920s and 1930s. Disney fans will recognize quite a few names that are inspired by people and places from Walt Disney's life as they walk along the street leading into the park. The second set of images reflect a modern day fashionista Disney fan. This look is fun and flirty and were taken in Disneyland. This look is an interpretation of a fashion forward Minnie Mouse with stripes replacing her signature polka dots and bright pink accents. I believe that a modern day Minnie Mouse would rock a pair of Tory Burch Heels if given the opportunity, she has always been very fashionable and has excellent taste in footwear! I hope these looks inspire you to learn more about the Walt Disney and visit a Disney Resort this Summer!